American, b. 1973, Seattle, USA, based in Seattle and San Francisco, USA. 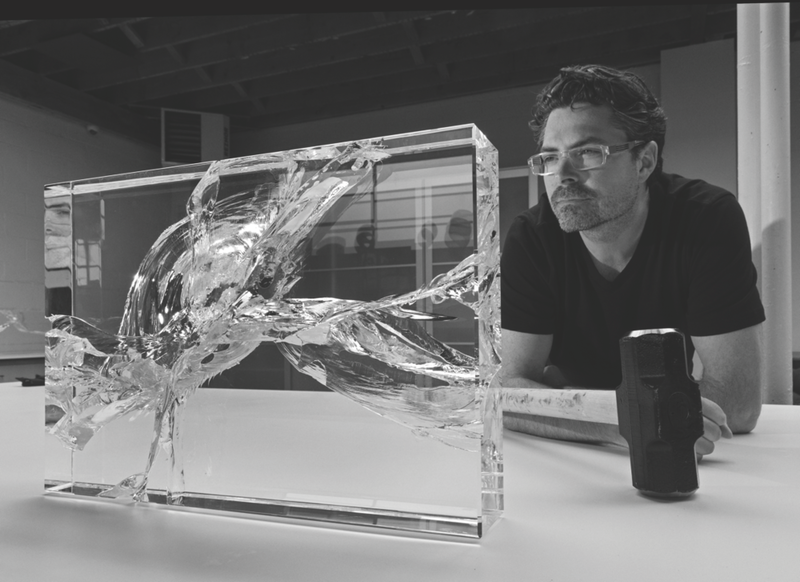 Artist John Kiley uses primary geometric forms as the architecture for his glass sculptures. In his spherical forms, juxtaposed colors and carved optic passageways create a separation of space, allowing the viewer to peer into and through the form. Often his sculptures are balanced on edge seeming to defy gravity. His Fractograph series takes a more conceptual approach to the material. Different methods including impact and thermal shock are used to shatter a perfectly polished optic blocks. The sometimes-powerful explosion are filmed in slow motion and exhibited along with the reconstructed blocks. John's work has been exhibited at galleries and museums around the world. He has been a visiting instructor at the National College of Art and Design in Dublin, Ireland, The Bezalel Academy of Art And Design in Jerusalem, Israel, The Pittsburgh Glass Center and Pratt Fine Arts Center in Seattle, WA. He has worked and demonstrated in Finland, Ireland, Mexico, Italy, Japan, Bulgaria, China, Australia, Brazil and Turkey.